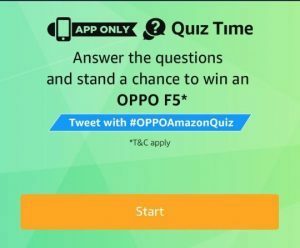 In today’s Amazon quiz, Answer and stand a chance to win Oppo F5 smartphone. Answer all the questions correctly and test your luck on winning. Q1) The OPPO F5 comes with a 16 MP primary camera and __ MP front facing camera. Fill in the blanks. Q2) Which of these phrases is associated with brand OPPO? Q3) The OPPO F5 is packed with how much RAM? Q4) What is OPPO’s fast charging technology called? 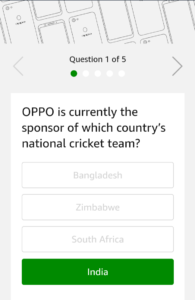 Q5) Which of the following is NOT a feature of OPPO F5? 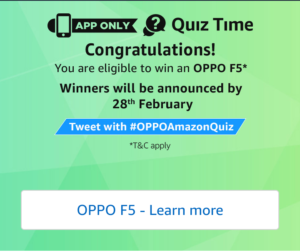 The declared winner(s) will be eligible for winning a coupon code to purchase an OPPO F5 device each for free from seller Appario Retail Pvt Ltd (hereinafter referred to as “Prize(s)”).